Your time machine has transported you back to ancient Egypt to test the Pharaoh’s Luck as you play online slots now. Climb up the sand dunes and admire the Sphynx in this arid 5 reel, 25 payline. Accumulate three scatter symbols and unlock the Pharaoh’s bonus game, who knows the treasure that rests inside. After their initial advent in 1997, Eyecon has only gone from strength to strength after moving away from the computer gaming industry and setting up shop in the online slot market. Eyecon can boast a whole range of titles to their name including the likes of Autumn Gold, Enchanted Prince, and 99 Time just to name a few of the big names. It’s certainly worth checking out their full repertoire when you spin slot games, there’s always something for everyone with Eyecon. Submerge yourself into an Arabian land filled with new treasures and embark on an Egyptian adventure full of excitement in which you will be educated about Egyptian culture and prophecy along your journey. 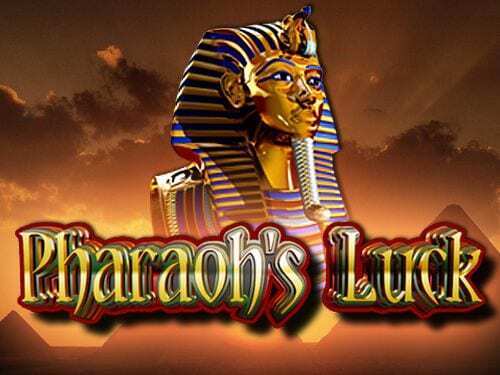 Most popular slots to play such as Pharaoh’s Luck feature 25 pay lines across 5 reels, bonus wilds, scatters and some great additional features for a diverse range of players to enjoy and sink their teeth into. The symbols on Pharaoh’s Luck consists of legendary Egyptian icons such as the Pharaoh’s mask, a Pyramid, the Eye of Horus, the Ankh, hieroglyphics and high playing card symbols. Of course, the top paid symbol is the Pyramid which also happens to be the wild symbol that pays out 10,000 credits for 5 such symbols. 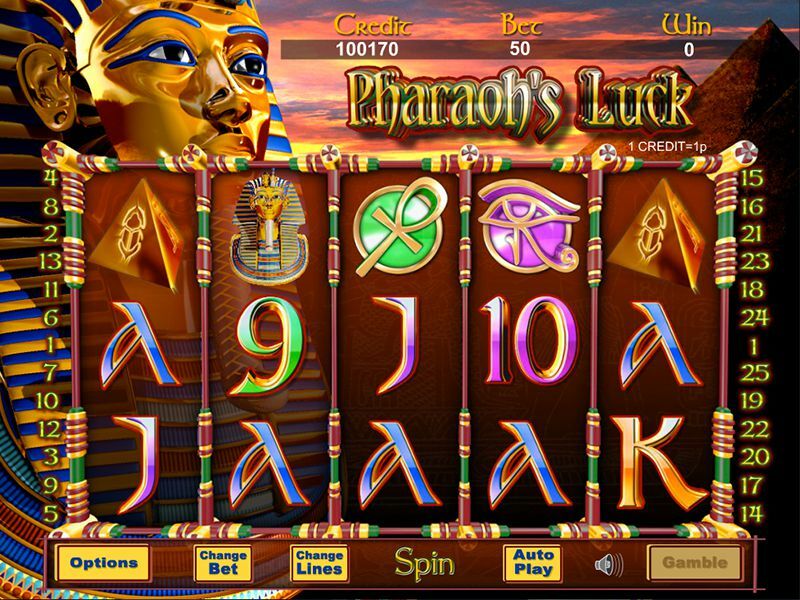 Pharaoh's Luck Game Features; a Wild Symbol, this wild symbol will replace all other symbols within the game except for the dreaded scatter symbol throughout your time playing this slot. When you match the scatter symbol 3, 4 or 5 times across the reels it will activate the bonus feature of the game. When the scatter symbols activate the bonus, players will be awarded the Mask Pick Bonus where players will pick any 3 masks to reveal their prize, and each mask could be worth up to x50 the total bet stake. Those are enormous profits. The coins on this game are set in credits whereby 1 credit is worth 1 pence. You may place your bet with 1, 2, 3, 5, 7, 10, 15, 20, 25 or 30 credits per line. Change Lines is another option that you have either to select all 25 lines or Line down to pick out your chosen number of lines. You will also find the easy Auto-play option where you may select 10, 20, 50 or 100 games to spin. Join the mummies and find their precious treasures right here and you will be feeling like a Pharaoh in no time when you play Pharaoh’s Luck. If you’re interested in history, or specifically Ancient Egyptian history then you certainly shouldn’t look past this slot game. Wizard Slots rates this game highly. Great graphics and great bonuses, happy spinning everybody.